Beautifully set with stunning wood accents and coordinating hardware, this officers and gentlemen item is a Victorian desk featuring classic antique style. A beautiful piece to place in hallways, bedrooms and living spaces, this hall table features a luxurious lift top that will turn this table into a desk that is both functional and beautiful. The gentle flip top lifts to reveal a fitted interior with built in picture holders and a single frieze drawer. 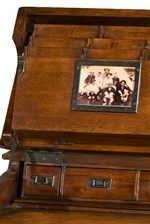 Sitting atop high wood legs with a decorative stretcher accent, this functional desk is one of majestic utility. The Campaign Officers and Gentlemen Lift Top Table Desk by Theodore Alexander at Alison Craig Home Furnishings in the Naples, Fort Myers, Pelican Bay, Pine Ridge, Bonita Spring, Golden Gate, Estero, Cape Coral, Marco Island, Sanibel/Captiva Island, Point Charlotte, Ave Maria, Florida area. Product availability may vary. Contact us for the most current availability on this product. This collection streams from the depths of a manufacturer who handcrafts furniture and accessories with a beautiful uncompromising quality, created by expert craftspeople, each table and desk in the Campaign collection will become a long lasting piece in your home, taking on an heirloom quality that will decorate your most favorite spaces. Covered in rich wood finishes with stunning veneer inlays, this desk table collection features a Victorian air that allows each piece to be used in multiple rooms of the house. Whether choosing to make a desk a dressing table, hall unit or kitchen organizer, the genuine style and shape of these pieces will compliment rooms through antique charm and grace. The Campaign collection is a great option if you are looking for Traditional furniture in the Naples, Fort Myers, Pelican Bay, Pine Ridge, Bonita Spring, Golden Gate, Estero, Cape Coral, Marco Island, Sanibel/Captiva Island, Point Charlotte, Ave Maria, Florida area. Browse other items in the Campaign collection from Alison Craig Home Furnishings in the Naples, Fort Myers, Pelican Bay, Pine Ridge, Bonita Spring, Golden Gate, Estero, Cape Coral, Marco Island, Sanibel/Captiva Island, Point Charlotte, Ave Maria, Florida area.